Last week, Google officially announced the sunset of Google Reader, a product I use almost daily. My head flooded with thoughts of 'What?! How can this be? What will I use now?' and I started reading articles on alternatives. I'm still pretty surprised by this decision, but I guess the signs were all there: bugs not being fixed, no new development, no user interface changes to match the new style of other products. But alas, I still had hope until last week. My research on other RSS reader platforms resulted in two potential selections: Feedly and Bloglovin'. Specifically, this Mashable article led me to check out Feedly. I downloaded the Chrome App for Feedly, which you open from the apps listed on a new tab in Chrome, and it automatically imported my Google Reader subscriptions. It was super easy to set up and the UI is pretty good. I like that Feedly shows which blogs you were following via Blogger. The colors are easy on the eyes, and there are options to filter by content posted 'Today' and to change the 'theme' (i.e. colors) of your Feedly dashboard. There are a few aspects I'm not a fan of, such as a Finance section and a few Ads. It also shows blogs that 'You might also like' - a feature which I could take or leave. The Blogger-Following filter, note the suggestion section on the bottom right. 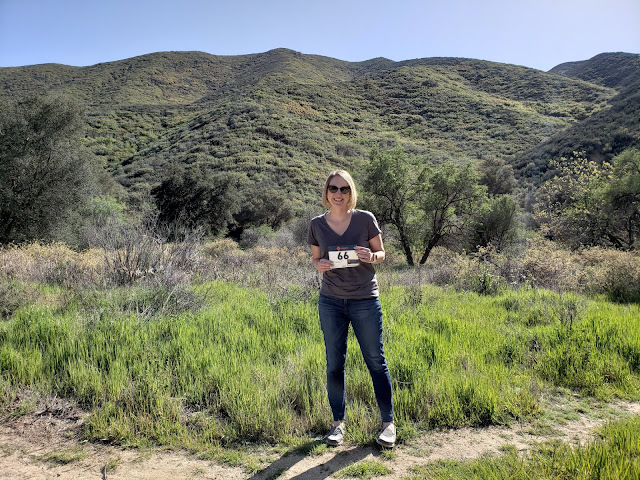 The second reader, Bloglovin', is noticeably (and not shockingly based on the name) more targeted to blogs and makes it super easy to find blogs to follow. Importing my Google Reader subscriptions took a bit more effort because I had to download the subscription file and then upload to Bloglovin', but it really wasn't hard to do. 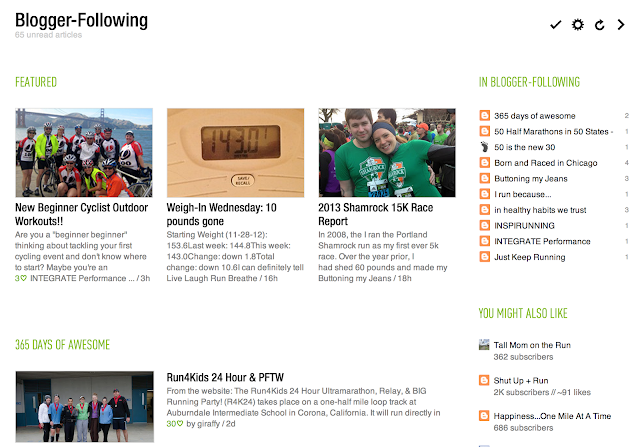 I have to say it was worth it - I'm liking the Bloglovin' UI. I'd found this a while back when I first started blogging, but I completely forgot about it until it came up on Twitter last week. Default landing page upon opening Bloglovin'. Bloglovin' allows users to set email preferences and will send a daily update of all blog posts, which I have discovered I like a lot. This way I see the blogs I want to follow easily and can click through the email instead of going to a separate site. I never though I'd be a follow by email person, but in the daily digest form it works for me. These two tools are my current preferences, with Bloglovin' leading Feedly by a bit. If you want to join me on Bloglovin', use my follow link on the right-hand side of the blog to follow me there! What is everyone out there using now? Have you switched yet or are you holding on until the last minute? Have you tried either of the ones I mention in this post? Let me know! Right now I'm still using Google and I have an app on my phone called mobileRSS, but I've downloaded everything I need for Feedly. Most likely, that's the one I'll use. I need to check out Bloglovin' a bit closer though since I haven't really looked at that one at all. It's worth checking out, I'm liking it (especially the email digests.) You'll like Feedly too, it's so easy to set up, but the UI isn't as clean for me. Gawker recommended a few sites and I'm trying out The Old Reader right now, but I think Bloglovin' (which they didn't talk about) looks good. Might have to try it! Yes no one mentioned Bloglovin - someone on Twitter brought it up and I remembered it! My fashion blog friends use it a lot and love it, and I'm leaning that way too. Thanks for your post, I too was surprised and disappointed by G reader closing doors and was wondering what was next. I just switched my blog back to blogger as Posterous also just checked out. I think Ill try Bloglovin' as well. Looks like a great option. See you there! Haha a lot of us are in denial! But my experience says they'll do it. Sad. So I've been confused on this. I don't use Google Reader, but I do use the reader through the old version of Blogger. Is that one going away too? Good question - I've never used it that way that I know of. I'm guessing if it's related it will be shut down too, but I don't know for sure. this is something I will have to check out before July hits. Why does Google seem to end a useful product like this? But they intend on keeping Google + and Orkut going even though no one uses it? I think Orkut is popular in Brazil, and that is about it. Great post! After reading this, I went ahead and signed up for Blog Lovin'. It actually imported all 96 feeds from my reader without any problem. I even did it from my phone. I'm not sure why you had to upload all of yours. Thanks so much for the tip! Bye Google Reader :(. Oh good! I did it day of, I wouldn't be surprised if their tech team did some quick work to make it simple that day. OR I just was totally oblivious. I remember seeing a new notice about it, but I'd already finished. I am using feedly, which works great with pocket, perhaps my all time favorite new app! I am notorious for emailing myself blogs, links, etc to read later! 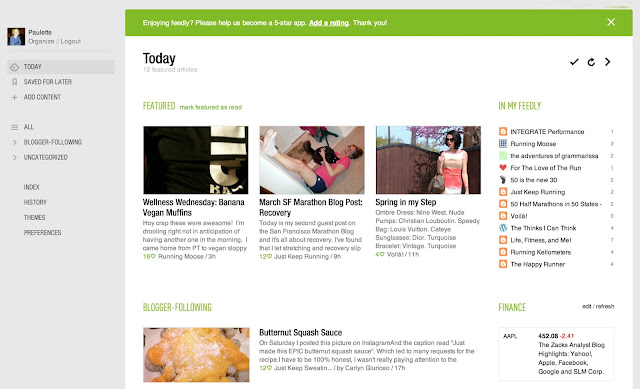 Bloglovin might work well with it too, I'm not sure...but feedly and pocket are my new favorite dynamic duo! I've been trying Feedly for about a week and I'm sort of getting used to it. But.....I wish Google Reader would stay! I think we are all still figuring it out, makes total sense. Maybe something new and amazing will come out of the woodwork! I just saw that you can get a version of Feeder that syncs across devices for $19.99. But as long as there are free things out there, I might just stick with one of them. Ohhh thanks for this post!! I was just looking at Feedly yesterday after seeing it on Lifehacker. 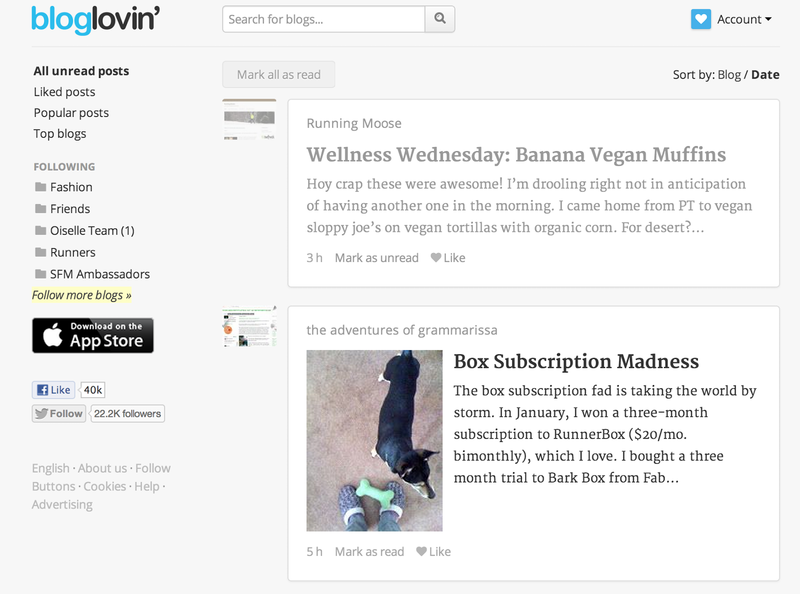 I am going to check out bloglovin too. I am sad about google reader. So does bloglovin have an app? I would love to have something on an app to read on my phone.. Yes there are! I didn't know either, one of my fashion blogger friends gave me the scoop! The great thing about reader was that it gave you a one-line-per blog format to start with. Click and then you could see a condensed version of the post, and if you wanted the full enchilada and comments you clicked through to the blog itself. Perfect. Things like feedly use up too much screen space for each blog..you can't see interesting posts at a glance anymore. I'd rather just have a list of links I click through one by one at that point and see everybodies blog directly. Agree that I like the one line per format better, although I'm strangely liking these at least for now. They haven't annoyed me much yet! True about the screen space though. Anything else you like? Open ears!